Editors: Cleveland-Innes, M.F. and Garrison, D.R. 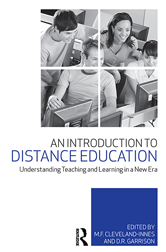 An Introduction to Distance Education is a comprehensive look at the field today, outlining current theories, practices and goals. The book reviews the influence of past distance education theory and practice, along with current changes. It outlines the practical skills and information that are essential to effective distance education design, delivery and navigation. This volume brings together seminal contributors who have and who are currently researching and shaping our understanding and practice of distance education. A discussion of past and present practices in higher and distance education leads to an understanding of accessible education and the appropriate use of Web 2.0 technology. Utilizing a student-guided approach, each chapter offers pedagogical features to engage and support the teaching and learning process, including: questions for reflection, review and discussion: students can use these questions as triggers for further thoughts related to the topic. Instructors can use these questions for classroom and online discussion, key quotations: strategically placed throughout the text, these points act as a springboard for further reflection and classroom discussion, concept definitions: central concepts discussed in the text are defined or students at the end of each chapter., A perfect textbook for educational technology Doctorate, Masters and Certificate programs, students will find An Introduction to Distance Education offers a solid foundation from which to explore and develop new approaches to designing and implementing online courses.